Tempered glass doors are increasingly popular in both commercial and residential markets and designers often choose to fit them with double-acting hinges. The DORMA TENSOR double-acting hinge is suitable for a wide range of applications, including conversions and renovations. Several installation methodsTENSOR is installed directly at the masonry or to a non-rebated frame. These hinges can also be installed directly to a fixed tempered glass panel, the only double-acting hinge on the market to do so. 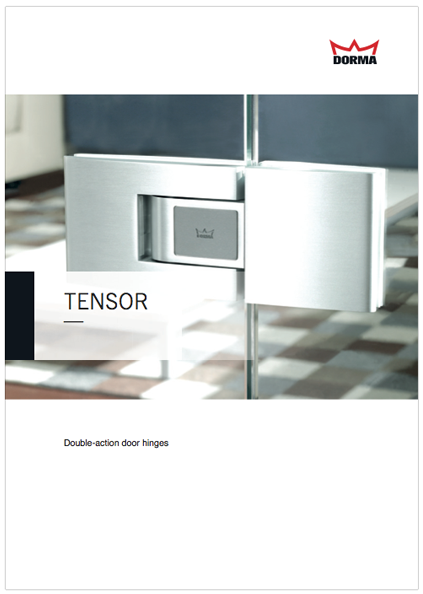 Automatic closing functionThe TENSOR hinge offers an automatic closing function engineered to bring the door safely back to its zero position – a position adjustable with in the hinge at any time to ensure that double-leaf doors remain precisely aligned. This convenient feature eliminates the need for a concealed floor or overhead closer, which may be ruled out due to on-site job constraints. Inlay protects hinge surface and technical coreAn inlay embossed with the DORMA logo provides a mechanical stop, protecting the hinge surface against damage when the door is opened to 90°. The inlay also protects TENSOR’s technical core – the simple, high-precision zero-position adjustment mechanism. This mechanism ensures the double-acting door closes efficiently and effectively. 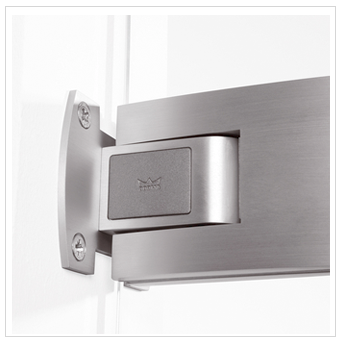 Hold-open feature, quick and secure closingAt 90°, the TENSOR system holds the door firmly and securely in position. Once pushed in the closing direction, the spring mechanism of the TENSOR fitting takes over, operating from an angle of 80°. The door closes quickly and securely. Successfully tested DORMA TENSOR hinges have been successfully tested for 500,000 operating cycles, making TENSOR a perfect addition to the DORMA family of top quality products.